I am a big Kung Fu fans. 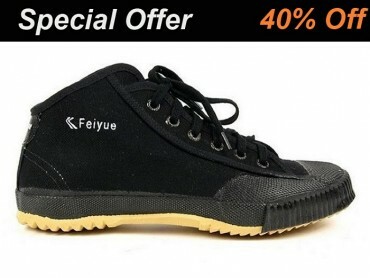 I like Feiyue Shoes, which are well known for Kung Fu. I bought a few Feiyue Martial Arts shoes. The high top one is my new favorite, which can support my ankle very well. These shoes are lightweight and the soles can grip the ground very well. The only problem is that the shoes are a little bit wide to me because I have a narrow feet. If you're a C-D width, though, you'll probably be fine. The high top shoes are good choice when you practice Kung Fu.